The net result of this was that English, though it had become effectively my only literary tongue, the only one in which I might myself aspire to write, was also experienced as foreign. ‘Who Would Be a Translator’, The Bulletin of the Midwest Modern Language Association, 1981. He studied in Cambridge in the early fifties where he met Ted Hughes and published his work as co-editor of the student magazine Saint Botolph’s Review in 1956. After Cambridge he worked for his father before beginning research into poetry in post-Stalinist Russia. He remained friends with Ted Hughes and when Hughes was looking for a collaborator to help him found MPT he turned to Daniel. The correspondence between the two men shows Weissbort’s extraordinary sense of commitment to the project. ‘It is great news you are stirring up so much electricity about the magazine,’ Hughes writes enthusiastically to Danny in February 1964. The MPT archive is full of Weissbort’s long and detailed letters to Hughes and other contributors. Weissbort, whilst always asking Hughes’s advice, took on the many administrative tasks associated with the magazine: giving it legal status, writing to subscribers, advisors and publishers, sifting through a great deal of material before sending it on to Hughes and suggesting themes for the issues and contributors. Weissbort openly admits to wanting Hughes’s opinions on work as he doesn’t trust his own poetic taste, an example of Weissbort’s self-deprecating modesty. The letters give the sense of a conscientious man who is anxious to do the right thing by the magazine and by Ted Hughes. ‘It’s important for you to simplify your life and clear away as much dross as possible to allow for really creative work,’ he writes to Hughes, anxious not to bother him with too much submitted work, although Weissbort himself was also a poet and struggling to balance a creative life with the work of an editor. By 1970 the work of the magazine was effectively done entirely by Weissbort and the strain on him was clear. The financial side of the magazine was precarious and Weissbort simply didn’t have the appetite for financial management – he said counting money sent shivers down his spine and working on accounts was ‘quite deadening, strangely depressing doing this kind of thing on one’s own’. 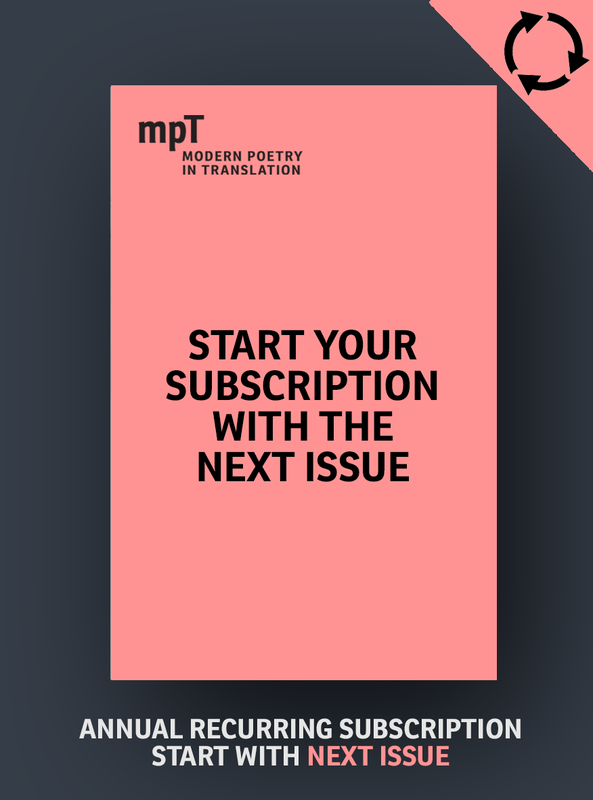 MPT was at first managed, in effect, as a small business, and whilst the large print runs indicate the enormous success of the venture, (Weissbort notes that an initial print run of 2,500 has all gone) the money for these sales was elusive. The strange thing is that I want to continue MPT against all advice, against all good sense, in the face of massive work load that I’ve taken on. etc. etc. I’m almost baffled by it. I feel as enthusiastic as I did at the beginning. Daniel Weissbort worked on a number of his own translations from Russian. Issue No. 1 of MPT includes his translations of Voznesensky. He also worked on a number of other contemporary Russian poets, including the human rights activist Natalya Gorbanevskaya who was imprisoned in a Soviet psychiatric ward after protesting against the Soviet Invasion of Czechoslovakia. He enjoyed a long friendship and collaboration with Joseph Brodsky, who came to the Poetry International Festival in London in 1972. His book From Russian with Love (2004) recounts the history of this friendship, examining Brodsky’s ideas about translation and poetry. Weissbort also translated, amongst others, Nikolai Zabolotsky, Regina Derieva and Inna Lisnianskaya and he edited a number of anthologies of Russian verse, most recently An Anthology of Contemporary Russian Women Poets (Carcanet, 2005) which he co-edited with his wife, the scholar Valentina Polukhina. The qualities he enacted – attentiveness, the understanding of his own embodied history and contingency, a committed other-directedness – as well as his practical vision, collaborative spirit, and openness to a variety of approaches, will live on as models for future translators. In Iowa Weissbort continued to edit MPT, and an Iowa Writing Programme issue appeared in 1974. He also wrote on translation and edited collections of essays on the translation of poetry. In 2007 he published a selection of Ted Hughes’s own unpublished translations. His interest in translation also extended to the active encouragement of a future generation of translators and he was instrumental in founding the Stephen Spender Prize. Working with Danny was never a matter of routine. It was he who knew the poets and the translators, and he would present me with a list of contents for the next issue, some typescripts and a list of addresses, and leave me to negotiate with the translators. There would often be last-minute additions and changes of mind, but somehow a coherent issue would emerge. We would take a bus along the Finchley Road, he from the north and I from the south, and meet at Swiss Cottage for coffee, where the café tables were always too small for the jumble of papers that Danny brought with him. Daniel Weissbort finally retired from Modern Poetry in Translation in 2003. The ‘scrappy-looking’ magazine, as Hughes wrote in his introduction to Modern Poetry in Translation: 1983, had become ‘a weighty Encyclopedia of Modern Poetry in Translation’. It was Daniel Weissbort’s persistence, taste, enthusiasm and openness which allowed the magazine to survive and flourish for so long.